The flameless combustion of hydrogen on the surface of a hydrophobized catalyst is investigated experimentally under various conditions. A quantitative interrelationship is discerned between the rate of catalytic oxidation of hydrogen and the catalyst surface temperature. It is shown that the presence of helium in the gas—air medium diminishes considerably the hydrogen oxidation rate by lowering the temperature of the catalytic surface by virtue of the high thermal conductivity of helium. 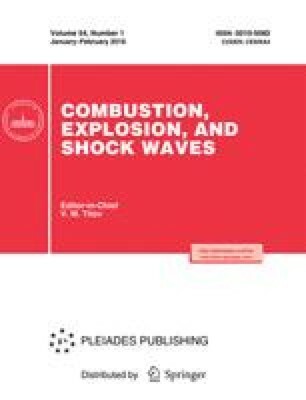 An approximate mathematical model is proposed for the flameless combustion of hydrogen on the surface of a catalyst. It is shown that the insertion of catalytic rods in metal tubes of diameter 20 mm significantly enhances the performance of each element by the judicious direction of strong convection flows from the heated surface of the rod. All-Russian Scientific-Research Institute of Firefighting, Balashikha. Translated from Fizika Goreniya i Vzryva, Vol. 31, No. 5, pp. 37–43, September–October, 1995.